Dr. Anwar Shafi, MD is a Doctor primarily located in Springfield, IL, with another office in Springfield, IL. His specialties include Pediatric Pulmonology and Pediatrics. He speaks English. The overall average patient rating of Dr. Anwar Shafi is Good. Dr. Anwar Shafi has been rated by 5 patients. From those 5 patients 0 of those left a comment along with their rating. 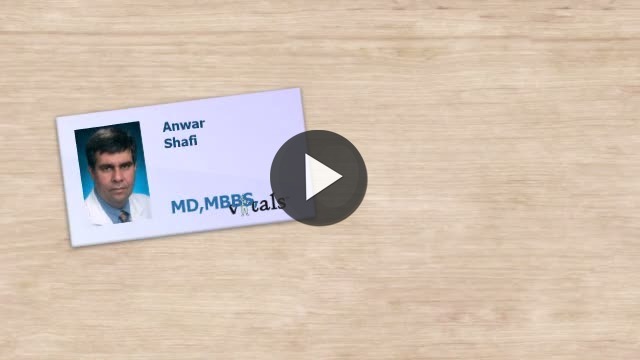 The overall rating for Dr. Anwar Shafi is 3.0 of 5.0 stars. A pediatric pulmonologist is the go-to resource for children who need treatment for any kind of breathing issue or lung disease. If your child coughs up blood, has a cough that isn’t going away, or displays other symptoms such as trouble breathing, chest pain or wheezing, you can ask your doctor to refer you to a pediatric pulmonologist. Common conditions and diseases they treat range from noisy breathing, asthma and chronic coughs to lung disease, apnea and cystic fibrosis. They can also diagnose and treat cases of pneumonia in children and prescribe any kind of respiratory medication or equipment your child might need. Take a minute to learn about Dr. Anwar Shafi, MD - Pediatric Pulmonology in Springfield, IL, in this video.